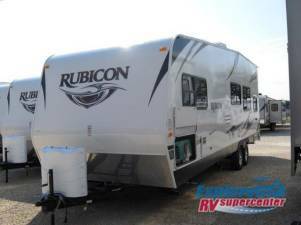 Dutchmen Rubicon Travel Trailer Toy Hauler w/Rear Ramp Door w/Spring Assist, 17' 3" Cargo Space, Sofa & Fold-Away Dinette, Both w/Overhead Storage Above, Dbl. Kitchen Sink, 3 Burner Range, Refrigerator, TV/Radio/DVD, Bath w/Toilet, Tub/Shower & Sink, Front Queen Bed w/Nightstand, Overhead Storage & Wardrobe, TV, Exterior Shower, Fuel Fill, Front Battery Storage Tray and Much More! Available Options May Include: HappiJack Power Bunks, 2 Chairs w/Table IPO Dinette.